Campbellford – “I do what I can.” Those five words spoken by Cathy Beamish is how she humbly takes her responsibility as a driving force here who was recently seeking donations for the Ojibway Women’s Lodge, in North Bay. This is not the first time Cathy has put her energy into a worthwhile project like this. Last year while President of the Rotary Club of Campbellford she put a call out for and collected winter clothes (hats, coats, boots, mittens, blankets) that were sent to the north for First Nations people. It was called“The Great Northern First Nation Coat Drive,” and is an initiative of Honouring Indigenous Peoples (HIP). Lola is always on the go. She is a part of HIP (Honouring Indigenous People) which is a Rotary inspired organization. 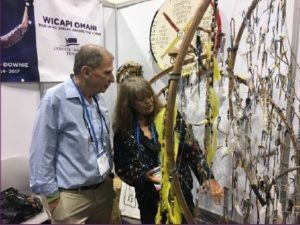 Here she and HIP Chairman Chris Snyder look at the world’s largest four directional dreamcatcher which Lola made. Cathy works with Lola Lawton, founder of Relay for Hunger, which is part of True North Aid, and is also part of an initiative to help HIP (Honouring Indigenous People). Lola lives in Flinton. “Lola is amazing. She is a part of HIP which is a Rotary inspired organization,” Cathy said. This time Lola had contacted Cathy to let her know she was campaigning for the I.D. Me project, which is an identification project for a battered women’s shelter in North Bay. It’s a First Nations Women’s Lodge. Well the response was amazing and Cathy just sent off the shipment to Lola which she is now taking to North Bay. “These projects are always ongoing, and I will keep collecting whatever I can,” Cathy told Trent Hills Now. For Cathy collecting clothing for winter or purses for the women’s shelter, it’s all part of an ongoing desire to help. This is a screen shot from a video about Ojibway Women’s Lodge, in North Bay and the project. The video link is in this article. “Lola gets calls from different organizations all the time for help and lets me know what she needs. When I have what she needs I call her and she picks them up,” she added with enthusiasm. The Ojibway Women’s Lodge in North Bay has been in operation for 30 years and the most important item in the purses is identification, Lola told Cathy in an email. So Lola was also simultaneously raising funds to be left in trust for Service Canada picture ID Cards. “This will allow women to change their address and enroll their children in school and rent an apartment, get their driver’s license, travel by plane or train. They can access foodbanks and health care. Without identification you can’t move on,” Lola explained. This is another screen shot from a video about Ojibway Women’s Lodge, in North Bay and the project. The video link is in this article. Lola, at this point had collected 52 purses and 25 were filled with necessary items. “I am 50 purses short and the necessary items to fill them,” she had told Cathy. Lola had sourced from all the area thrift stores and in Belleville, to St. Vincent and Three Oaks, she also went to Gleaners and Procter and Gamble too! “I’m having difficulty getting the campaign rolling,” had said. Well that is all Cathy needed to hear. This is a screen shot from the video about Ojibway Women’s Lodge, in North Bay. The video link is in this article. 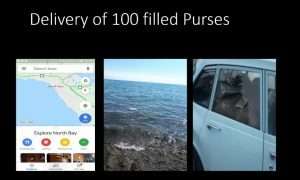 Now that the purses have been collected, Lola is on her way with the filled purses to Ojibway Women’s Lodge in North Bay and while up there she is going to meet with Children’s Services, the food bank and discuss what else is needed. Lola, at the time of writing the email to Cathy, also mentioned she had raised $500 of the $2000 goal, which includes $1,000 for the identification fund and $500 for items needed and the other $500 would pay for her gas and overnight accommodation…always transparent about where the money will go. “All women’s shelters need this type of trust fund and once I establish this one I will seek government and corporate assistance to provide for other Women’s shelters,” Lola explained. The Rotary Club of Campbellford and individual members donated $300. Cathy explained It costs $30 for each woman to have her identification set up through the government. For Cathy these projects are close to her heart and to see the support she receives is sometimes overwhelming. “We have a lot of wonderful people in our community,” she said with emotion. The Ojibway Women’s Lodge provides a helping hand and ecouragement to women so they can realize their full potential, in order to rebuild their lives. Supportive staff help women indentify choices available to them, and respect a woman’s right to make her own decisions. For aboriginal people, violence against women is understood as a community issue that requires healing of the woman, the family and the community. At the Ojibway Women’s Lodge we provide a community based, cultural and holistic healing approach to ending violence against all women. HIP was created by Rotarians in Southern Ontario in partnership and consultation with a number of indigenous people.